anyone live around metro atlanta,or anywhere in ga with wielii's,willing to give me some pointers? Look in lawns of newer subdivisions about 3-6yrs ols, and older. Also look for areas around the neighborhood where smaller sweetgums and pines are, this usually means the ground was disturbed previously at some point. Also look along clearings for power lines and old flood planes(ones that don't flood anymore though) Always check to see if the ground your searching is even red clay(its usually not bright red, but rather a brownish red) The main thing is to look in areas previously disturbed by construction of some sort in the past 3-8yrs, and look under small baby sweetgum trees. Check in low grounds, where it stays moist but doesn't flood(this is a must also) And there can't be too much pine straw on the ground, or the soil is too acidic. And don't waste you time searching in old forests, they will never be found there unless the ground was disturbed in some way. LK: do Ps. weilii have veils when they are pinning? are the caps on the pins always black? ... I think I discovered some weilii pins near my Pan subb patch. I hope that they are weilii, they're just pins now, caps are about as big around as.. hm almost as big as a dime in diameter. I may go get some pics of them. Weilii has what you call a partial cortinate veil, meaning it has a spider webby type veil, and it rarely leaves any remnants of veil on the stem after matuity. I'll post a pic of pins and the veil in just a sec, but definately take some pics, try to get some clear pics, and I will tell you for sure if you have weilii or not. I have my fingers crossed for you. The caps on the pins are always either black, or a dark redish/carmel color. Go get some pics! Bah, now that you posted those pics of the pins, i highly doubt that mine are Weilii. Heres a pic of mine. Heres a small Pan sub. Hmmm....when those mature, pick them and take good pics of the cap, gills, and stem, and of course check for a bluing reaction. Those just might be weilii, its hard to tell, but they do look like weilii. they look a bit like ceurelasens too..... but check for bluing. I'll keep an eye on them. I'll check them tomorrow afternoon to see how they are doing. I have doubts about this mushroom, i've seen pins smiliar to these where the grass meets the woods in the back yard, only diffrence is those pins had a metallic tint to them. The pins grew up to be some brown capped, white gilled mushroom that didn't briuse blue. Anyway- I'll keep an eye on these and I'll have some more pics tomorrow. BTW- are ceurelasens native to GA? if so what is their habitat? Mitch, you don't think any of the weilii I've posted looks like caerulescens? Thats what I've always said. In my opinion, Ps. 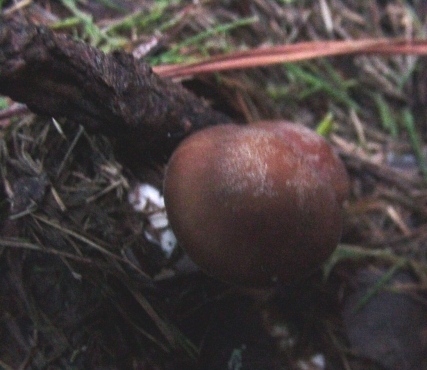 weilii should be "Psilocybe caerulescens var. weilii"
Heres a few pics of weilii that look similar to your pin. There are alot of mushrooms that take on the general color and shape of weilii, and without a better pic I really can't tell. 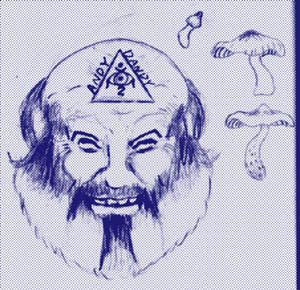 Say is there in relation between the georgia Wielii 'shroom and the North Georgia Psilocybe Cub spores that a vendor or two are selling? I understand that the North Georgia spores are very good.... anyone else ever hear of them? No, no relation. I sent in a few prints of cubies I found a few years back in North GA, and now a few vendors carry it. 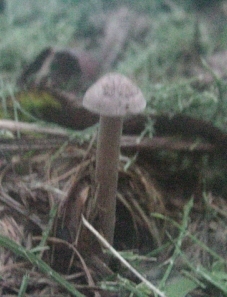 The weilii is an entire different specie that also grows in north GA.
Heres todays pics of the mushrooms in questions... sorry bout quality, the lense wouldnt stop fogging up. 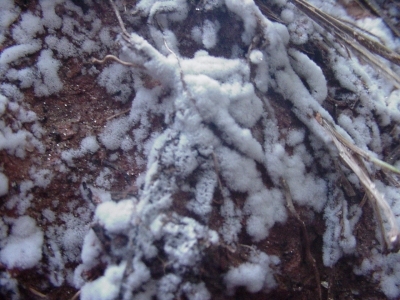 Here are some mycelium that are covering a 3x2ft patch of dirt on an area that is constantly being eroded.. maybe weilii? Its still hard to tell, but it sure does look like weilii. PIck it before we meet up saturday and bring it with. I still haven't found very many this week after all that rain, only one loner. I'm hoing to find a few more before this weekend. 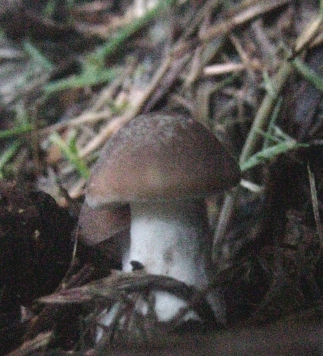 Yep, those are the only 2 that i have found, and oddly enough, they are around that same grasspile that the Panaeolus are coming out of, right under the sweetgum tree. There are so many diffrent mushrooms that 1 area its un believeable, on the north side of the patch I've got TONS of Agaricus mushrooms growing. 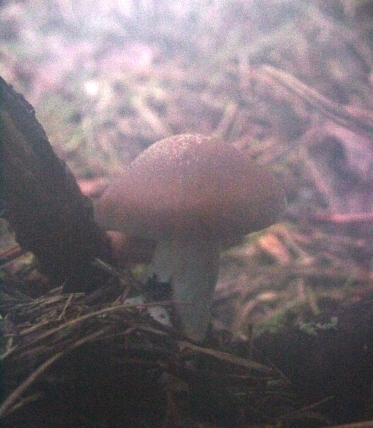 I found a bolete and a destroying angel in the same area. Lots of mushrooms to be found around my yard :P I've been so damned busy lately that that is the only place I've had a chance to look. I'll bring the shrooms on Saturday. I wipe off the lense after every picture but any time i get it near the ground it foggs right back up :\ Oh well. Well I'm off to chat in #shroomery for a while then study for a history test. 3,381 topic views. 14 members, 46 guests and 6 web crawlers are browsing this forum.